Hopefully, you viewed our list of the best cookware sets available. Whether you have or may not have, one piece of cookware regularly came into the discussion of the Dutch oven. So why are we mentioning this dish? For one reason the tool is versatile to use for indoor and outdoor cooking. Whether it is savory soup, cheesy potatoes, or sweet cobbler, it is a perfect pick for any food dish. The amazing thing is we have selected the best Dutch ovens available on the market for you. So if you need one bowl to prepare different meals to make sure to look at the list that follows here. The Lodge Dutch Oven you can buy in 2 QT, 5 QT, and a 7 QT size. The Lodge is an American made pot with a classic design. You can sear, braise, simmer, sauté, fry and roast in it on the stovetop or fire. The cookware is pre-seasoned and provides unparalleled heat for even cooking. You can also use it inside the oven. Caring for the cookware is a breeze and needs washing with mild soap, dried, and rubbed with vegetable oil. Suitable For: Indoor and Outdoor Cooking. Add this excellent addition to your cookware set. 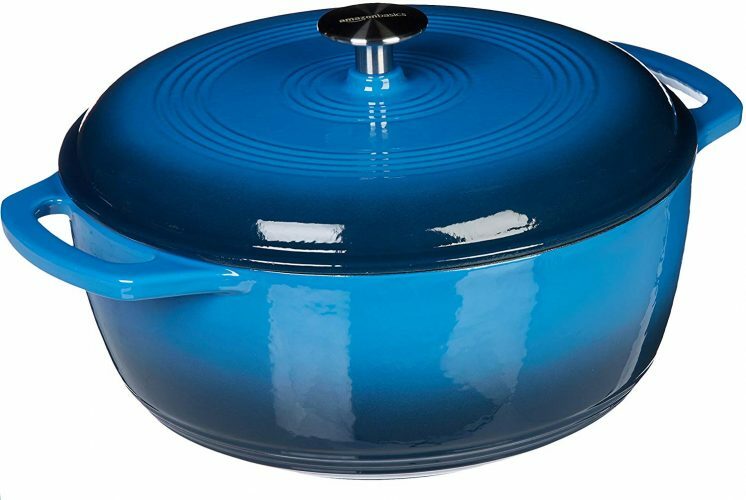 The Dutch oven from Amazon has an enameled cast iron finish to last a long time of use. You can sauté, roast, and do loads of things with this dish. Use it on the stovetop to brown your meat and onion and add liquids by placing it in the oven. You can even put it in the refrigerator to the stove to the table. And if you love outdoor cooking, you can use it on the barbeque as well. 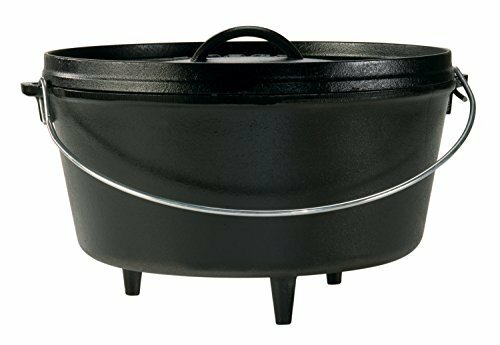 For low and slow cooking, you need the Vremi Dutch Oven that works on all stovetops. 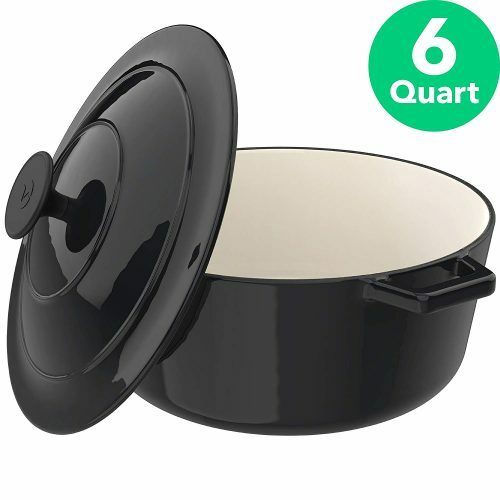 The 6-quart pot is perfect for soup, casseroles, sauces and more. You can take the cookware from the stove to the table for dishing up. Bake up a storm in the oven, as it is oven safe with the lid. 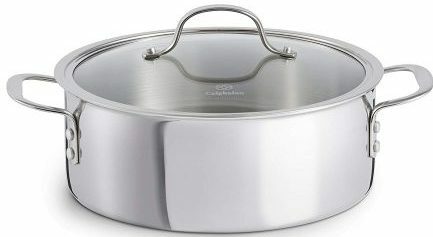 The stainless steel Dutch oven from Calphalon has a long lasting design. The pots excellent for browning food and you can use it with all utensils. The brushless stainless steel finish looks elegant in any kitchen. You can use it on the stove and place it on the table. The cleared glass lid makes it able for you to keep an eye on the food while it is cooking. The dome-shaped cover provides continuous self-basting to add flavor to the meat. 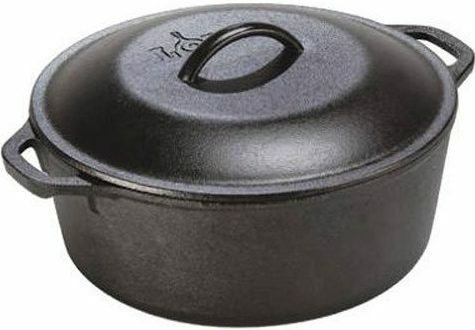 For camp cooking at your next weekend away, you need the following Dutch oven from Lodge. You can buy the dish in three different sizes best suited for your family needs. You can use the flanged lid to hold coals or use the inverts as a grill. The cookware has built-in legs to sit over the fire. The pots pre-seasoned with soy-based vegetable oil and the more you use it, the better it becomes. 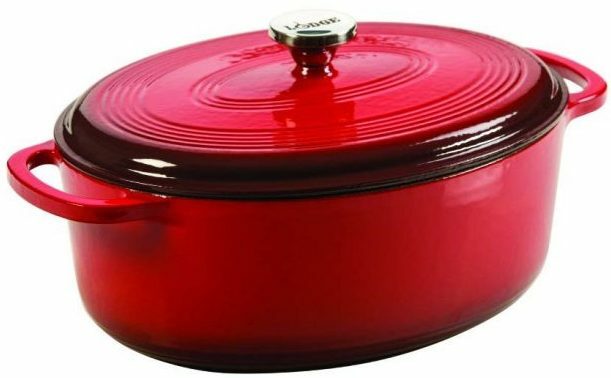 The Island Spice Red Dutch Oven from Lodge looks great standing on the fire and just as comfortable in the home. You can use it marinate meat, sauté, cook, roast and so much more. The porcelain enamel and cast iron structure have a high heat tolerance and great to use on the stovetop and in the oven as well. 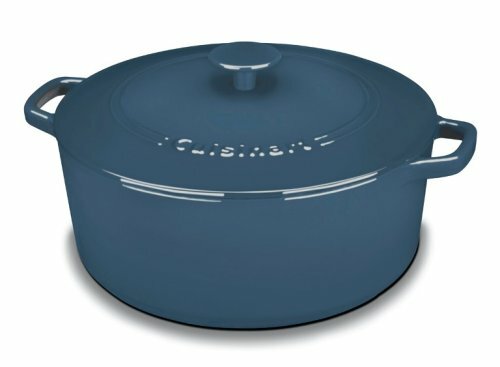 The casserole cookware from Cuisinart fits in with any cookware in your kitchen. The Provencal Blue color stands out and is available in four different sizes. 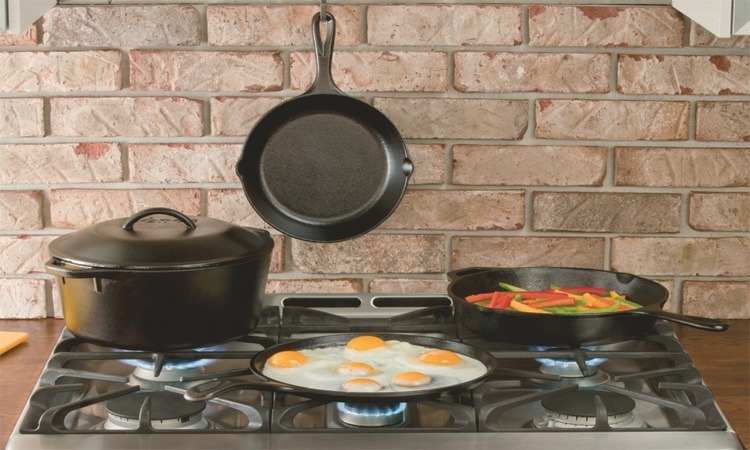 The cast iron construction helps retain heat for even cooking and has a porcelain enamel exterior. The pot is versatile to use in the oven and on stovetops. 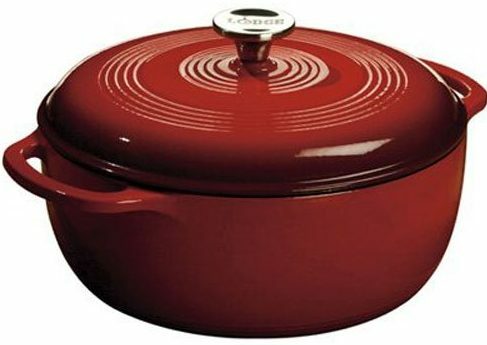 The red cast iron Dutch oven from Lodge looks fantastic. The 7-quart size is perfect to cook a meal for a small family. The self-basting lid ensures that flavors remain in the meat while roasting. The enamel exterior keeps the cookware durable and long lasting to use. The cover has a stainless steel knob and suitable to use on different stovetops. 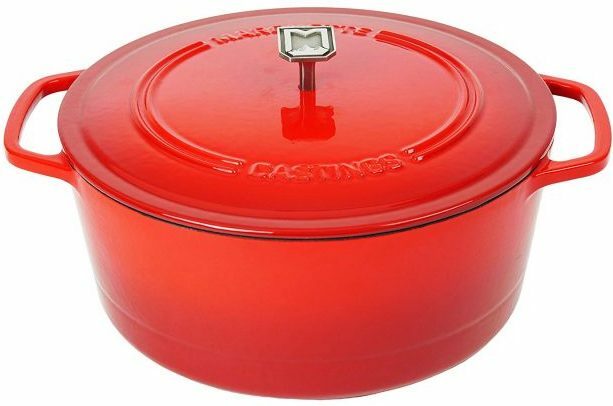 The Marquette Dutch Oven you can buy in Iron Red, Black, Blue, and White. The pot makes a perfect addition to any home when it comes to cooking casseroles and more. You get a lifetime warranty included, and it is oven safe. For ease of carrying it from the stove to table, it has loop handles with a flat bottom to use on induction ranges and glass tops. 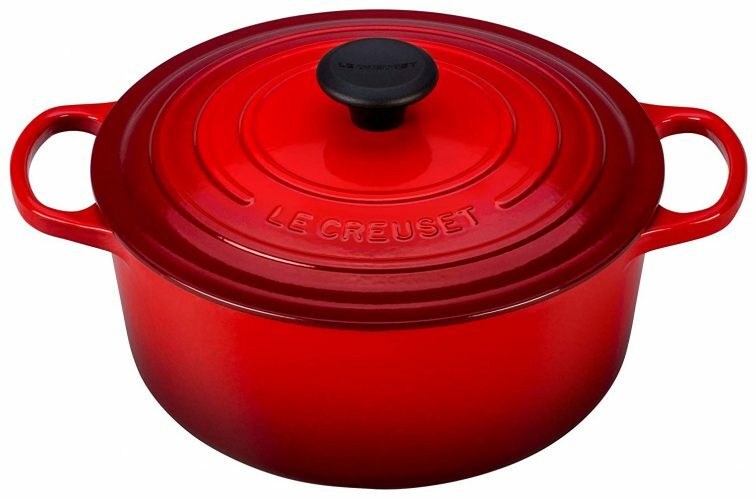 The Le Creuset Dutch Oven does not come cheap but is one of the best available on the market. You can pick your favorite color from the wide selection available to fit in with your kitchen décor. The pot has a sure grip and works on all stovetops and the oven. The sand-colored interior offers more resistance to wear. The lid has a large composite knob, and it has a round shape. We hope that the top 10 best Dutch ovens on the list help you to find a favorite to buy. Whether you plan a dinner at the table or a BBQ outdoors, the cookware is always ready to lend a hand. The brands on the list offer you durable and fashionable dishes you can place on the stovetop, in the oven and set on the table. Pick your one today and start making delicious food indoors and outdoors.